Fans of JRR Tolkien are to get a rare chance of a close-up view of one of the landmarks said to have been a key inspiration in the author's young life. 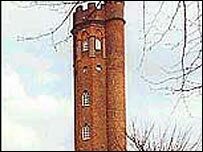 The grounds of Perrott's Folly, a 96ft (29m) high tower in Edgbaston, Birmingham, will be opened to eight busloads of Tolkien enthusiasts. It is part of the Tolkien Weekend based at Sarehole Mill in Hall Green, another of the author's childhood haunts. The inside of the Folly remains off limits as restoration works continue. The chairman of Perrott's Folly Company Ltd Dennis Minnis said: "It won't be possible to go into the tower because work is still going on, but eventually it will be open - in about another two years. "He (Tolkien) would have passed this tower and the Edgbaston water tower on the way to (St. Philip's) school at the Oratory and then down at King Edward's school at Five Ways. "There are a number of other matters in the Lord of the Rings trilogy that relate to Edgbaston and local areas, and it's quite natural to believe that these were the inspiration for The Two Towers," said Mr Minnis.